Home / Blog / We Do / How Much Does It Cost to Hire an ASP.NET and SQL Developer in Ukraine? How Much Does It Cost to Hire an ASP.NET and SQL Developer in Ukraine? ASP.NET, as a part of the Microsoft .NET technology, it was firstly presented in 2002 for building interactive web pages and data-driven web applications. The ASP.NET is based on a variety of languages, provides a huge standard class library, and has a quick Common Language Runtime (CLR) that runs the code and additional services to speed up and simplify the development process and allows programmers to create ASP.NET apps in various .NET supported languages such as C#, F#, and VB.NET. Thanks to its code-behind mode, state management, and smart caching, ASP.NET technology quickly became a mature and popular solution for web application development. Websites created with ASP.NET tend to be faster and more efficient than PHP-bases ones. ASP.NET apps are compiled within a short time and only once, so it is the object code that is performed really quickly. It makes ASP.NET a popular solution for web app developers and there are many online sources dedicated to ASP.NET technology. Being an open source, the ASP.NET framework is actively contributed to by a global development community and Microsoft development team. It is essential to be able to access data from a database, and thus, ASP.NET works with Oracle and Microsoft SQL Server. Also, it supports new forms of databases such as MongoDB and MySQL. SQL is the most convenient solution when it comes to ASP.NET development and that is why these two technologies usually go in a pair for every well-qualified web app developer. In conclusion, we may say that ASP.NET is a free, easy-to-use, and wide-known framework for creating websites and web apps. With ASP.NET and SQL technologies, you get full control over the development process and can build a remarkable product shortly. Now, let’s take a look at what is SQL developer and what projects can be created with the use of ASP.NET. What Projects Can ASP.NET Work On? What Is SQL Developer Capable Of? ASP.NET is a remarkable technology that allows building various types on websites, web apps, microservices, and even platforms providing customers with high-quality content in real time. ASP.NET is usually used for creating interactive data-driven web apps. With a big number of building and control features such as text fields, buttons, configuration tags, the technology helps to develop a product from scratch shortly. There are many companies that use ASP.NET technology including Dell, TCS, Epic Systems, Accenture, etc. SQL developers usually work with a free graphical user interface known as Oracle SQL developers that allows database users and admins to complete tasks within a few clicks. The main objective of this tool to save the time of the customer and maximize the revenue of the business owner. It is widely used for web development because of the possibility to manage, browse, export, and import databases easily and, thus, launch and deploy web apps. How to Choose Between ASP.NET + SQL Developer and ASP.NET Development Company? The first thing companies tend to look for is a local programmer living in the same city/region. Unfortunately, usually, it is hard to find and hire SQL programmer or ASP.NET coder with desired experience and knowledge living in the same location as you because there are not many specialists situated in every city of the world. Therefore, you will probably hire the person who is at least familiar with ASP.NET technology or at least knows what is SQL developer, but there are no guarantees that this employee will be capable of fulfilling the development at the level it was planned initially. Also, you need to provide the programmer with a working place and supply, pay taxes, and still, look for an additional specialist. It is easy to find freelance ASP.NET programmers with stronger knowledge and experience in the field at such platforms as Upwork or Freelancer. Hiring a freelancer will cost cheaper than the in-house worker and you will probably get a better specialist than the one living in your region. However, when you hire ASP.NET developers on a freelance basis, the obligations of both sides are not strong enough to avoid any force majeure. The freelance developer can leave the project before he completes it, delay the development, and not reply in time. You can discuss working hours and provide all the requirements, but there will be always a possibility that the programmer can abandon your project in favor of another job offer. This is the most reliable way to find dedicated specialists to work on the ASP.NET development project. Full-time remote workers will process the creation of your application only based on the schedule and requirements written in the contract. They will report to you or your project manager directly and provide you with outstanding services within the given time. Although hiring remote employees usually costs more than freelance once, the quality and reliability of the development follow that cost and every person knows what is SQL developer and what ASP.NET features can work for your project. Therefore, if you plan to create a great complex application, consider outstaffing and outsourcing options. If you want to hire ASP.NET developers with SQL knowledge, but experience difficulties in finding the right ones nearby – our company can offer outstaffing solutions, created exactly for this purpose. You apply with your request and our HRs are looking for ideal candidates by testing and interviewing them. After programmers are chosen – you hire them and proceed to work immediately after. It really is as easy as that. The popularity of outstaffing services for ASP.NET web development grows each day, because programmers have the desire to work for big companies or projects, and employers, on the other hand, are looking for such professionals, and certainly not with the help of Google. And now let’s proceed to numbers. According to PayScale, the middle ASP.NET developer salary in the US is $67,396/year. Junior SQL developer salary NYC is $71,300/year on average. And finally, the combo of .NET and SQL languages gets the biggest salary of three mentioned: $75,600/year. As you can see, Swiss programmers earn the highest income even comparing to the US. ASP.NET developer salary UK based is practically half of this amount, however, it is still much higher than Ukrainian specialists earn. At the same time, it is known that Ukrainian coders are highly qualified and ASP.NET developer salary depends a lot on the country of origin. Therefore, it is worth considering hiring a dedicated Ukrainian ASP.NET developer or ASP.NET development company to work remotely on your project for the affordable cost. Since ASP.NET development acquires knowledge of .NET programming language, it would be nice to show you numbers for this kind of developers. 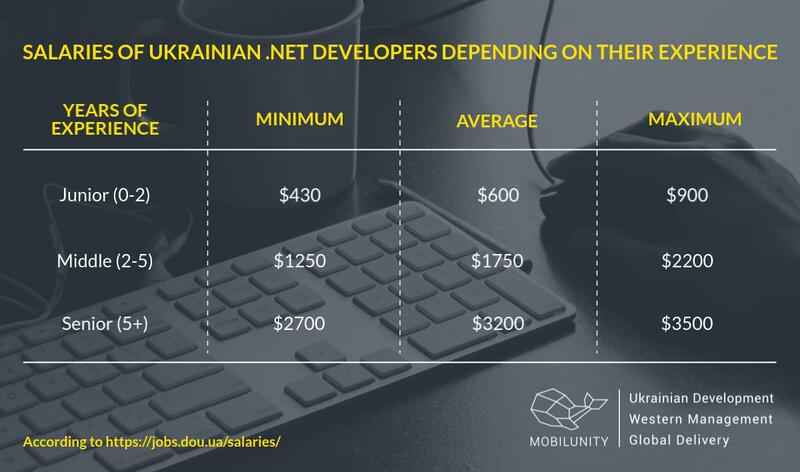 Averagely, Ukrainian middle .NET coder earns $1,750/month, as you can see from ASP.NET developer salary rates in the table below. SQL database developer salary is $1,500/month on average, as shown in the table below. The sum of money they earn is quite low because nowadays knowledge of SQL language is not enough to develop a complete app or software. Is It Easy to Find and Hire ASP.NET Developers and SQL Programmers in Ukraine? As you can see, the number of programmers experienced with ASP.NET and SQL software development is much higher than the number of opportunities available in the Ukrainian market. Therefore, almost every single ASP.NET developer and ASP.NET development company are interested in working for international projects providing outstaffing and outsourcing help respectively. It is beneficial to find a reliable ASP.NET programmer with SQL knowledge here in Ukraine to extend your development team with the outstaffed programmer. As we noticed before, the cost of hiring Ukrainian specialists is lower than hiring Western Europe programmers and ASP.NET developer hourly rate in Ukraine is just $15. What Skills Should Reliable ASP.Net Developer Resume Contain? If you are looking for an ASP.NET resume sample, take a look at this remarkable example of Senior specialist. The proven experience is put first and the skills are mentioned afterward, so employers can easily read the structured CV and understand what the person is capable of..
Nowadays many employers experience difficulties while searching for good candidates for a team of dedicated ASP.NET and SQL developers positions. It can be explained by the lack of professionals in the local market. Ukrainian developers are getting more and more popular today due to the high level of knowledge they acquire along with talent and flexible, yet professional attitude to tasks. They are highly demanded not only in Ukrainian outsourcing companies but worldwide as well. Our recruitment team of professionals has a lot of years of experience selecting ASP.NET developer interview questions for better efficiency of hiring. That’s why we guarantee you to find the best developer for your project very fast. At Mobilunity, we well-qualified programmers with ASP.NET and SQL software development experience and we will be happy to put our knowledge into your project. If you are looking to hire ASP.NET developer or SQL expert to join your team, we can provide the best candidates!